Roscosmos cosmonauts Mikhail Korniyenko, Sergey Volkov and NASA astronaut Scott Kelly (left to right) after landing, the landing of manned spacecraft vehicle "Soyuz TMA-18M" to Earth. The Soyuz TMA-18M spaceship manned by an international crew - Sergei Volkov and Mikhail Korniyenko of Russia and Scott Kelly of NASA - has successfully landed in Kazakhstan, an Interfax-AVN correspondent reported from the Mission Control Center in the Moscow region. The Mission Control Center applauded the touchdown news. Doctors will examine the cosmonauts and the astronaut upon their return to the Earth. 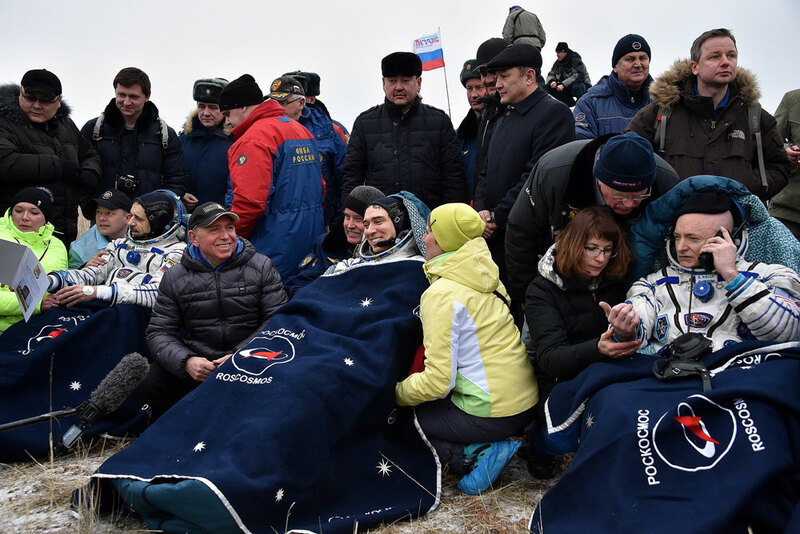 Airborne forces and search-and-rescue crews were moved to operative airfields in the Republic of Kazakhstan to meet the landing capsule of the Soyuz TMA-18M spaceship, the Russian Central Military District said. Kelly and Korniyenko took part in the first-ever yearlong mission to the International Space Station (ISS). Prior to that, long-term space missions were performed only onboard of Russia's Mir orbiting station almost 20 years ago. The next expedition will depart for the ISS on March 19. It will comprise of Russian cosmonauts Alexei Ovchinin and Oleg Skripochka and NASA astronaut Jeffrey Williams.